An industrial bulletin by London Underground workers, for London Underground workers. 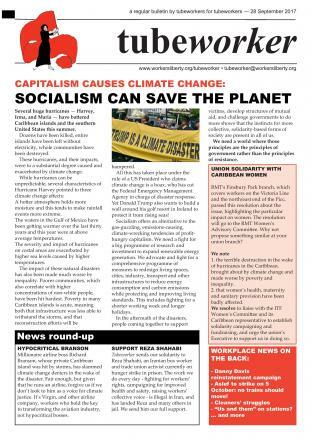 This issue contains the latest news from the fight against job cuts and discussion of how to fight back, plus updates from the ISS cleaners' struggle, as well as your local and workplace stories. This issue discusses the ISS cleaners' fight against biometric fingerprinting, the ongoing LU jobs battle, plus your local and workplace stories. This issue discusses how LU's "Fit for the Future — Stations" proposals will negatively impact diversity and equality, and makes the case for a fighting fund to finance sustained strikes. Plus your local and workplace stories. This special edition discusses the suspension of the RMT's planned three-day strike and offers some suggestions for how to push forward to consolidate the concessions won and win more. It also republishes local and workplace stories from the April edition, with some updates. The RMT strike on the Tube scheduled for 5-8 May has been suspended. The union's announcement is below. An industrial bulletin for London Underground workers, by London Underground workers. This issue focuses on building the next strikes to stop LU management's "Fit for the Future — Stations" cuts plan, as well as reporting on developing disputes amongst cleaning workers. It argues for Tube workers not to vote for Ukip in the upcoming elections, and includes your local and workplace stories. This issues looks back on the life of Bob Crow, and urges unions to name new action in the fight against staff cuts and ticket office closures on the Tube. Plus your local and workplace stories. This issue gives proposals for keeping up the momentum in the "Every Job Matters" dispute, and includes local and workplace stories. This updated issue discusses the suspension of RMT and TSSA's strikes against job losses, and what unions can do to push for greater concessions from management. This issue looks back on the hugely successful 4-6 February strike and looks forward to the 11-13 February strike. It calls for a broadened-out and more democratic strike committee, for the union to name the next dates for action now, and to support sustained action with strike funds. It also includes an appeal to ASLEF members to stand up and be counted in this vital dispute for the future of the job.